the Northern Rockies provincial land use protection area." 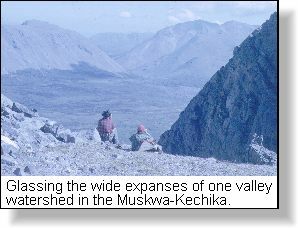 I have been fortunate to have spend some of my summers in the Northern Rockies, in parts of that area of the newest provincial land use protection area known as the Muskwa-Kechika. My trips were a mixture of fishing, hunting and photography, backpacking many of the watersheds announced as included in the land use decision by the Premier. They were glorious trips amongst varied and numerous wildlife species, and mesmerising scenic splendour. 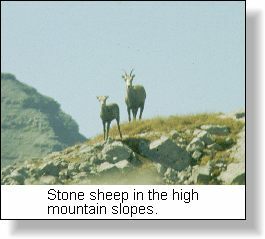 There were glacial streams dark with large finned grayling overlooked by white mountain goats high on rocky crags. 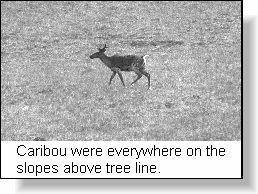 Caribou rested on glacial snows high in watershed basins while stone sheep fed and gambolled on mountain meadows. It was, and now, fortunately, remains a land of youthful memories. I commend the Premier on this magnificent gesture, to preserve that which is a raw example of pristine British Columbia for future generations. By proclaiming the Northern Rockies as a special land use area the Premier has assured those of the next millennium, a place where they can experience that which has made this province so rich and bountiful. I congratulate him and his government on their foresight and vision! The Muskwa-Kechika protection area protects more than 4.4 million hectares of the Northern Rockies wilderness in the largest land-use decision of its kind in North America. The area included is larger than Switzerland and the size of Nova Scotia! "The Northern Rockies is British Columbia's gift to the world for the coming millennium," Clark said. "Perhaps no single land-use decision anywhere has moved sustainability forward so dramatically through conservation, resource development and cooperative management. This is a huge, extraordinary wilderness area that will continue to thrive because the people of this province have worked together towards a common vision." The Muskwa-Kechika protection area includes the designation of 1.17 million hectares of new and existing protected areas at the heart of the Northern Rockies. These are surrounded by a 3.24 million-hectare special management area where resource development will be undertaken with environmentally-sensitive management. According to the news release, "The wildlife populations are unparalleled in B.C. - 4,000 caribou, 15,000 elk, 22,000 moose and 7,000 stone sheep. The area supports the only plains bison population in the province and also includes 3,500 black and grizzly bears. 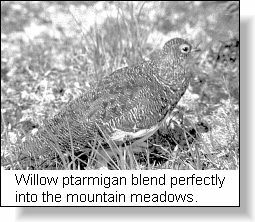 Upland game birds include the sharp-tailed, ruffled and blue grouse and several species of ptarmigan. Wetlands provide habitat for the Canada and snow goose, trumpeter swan and a variety of ducks. Predator species include the gyrfalcon, bald eagle, boreal owl and broad-winged hawk." Having spent time in these areas I can assure you that wildlife is there in profusion. They were the focus for our trips and our experiences were many in this vast untamed land. 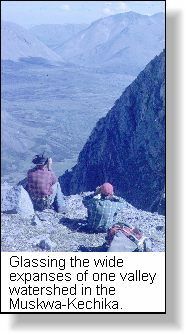 Because we were backpacking, we remained high in the various mountain ranges to stay out of the tangle thickets of buckbrush and willow. In these high ranges everything appeared miniaturize for we were climbing at or above the tree line. It provided a strange feeling to watch the many caribou and grizzly bears as tall as the trees which were stunted because of the extremes of climate. In numerous locations we found true hanging valleys, wide basins usually with a waterfall and lush plant growth. Ptarmigan were everywhere in these high altitude breadbaskets of the Rockies. Fog often occurred even though most of our trips were in August. Scurrying family flocks of ptarmigan often made ghostly shapes as they moved around us.